Submitted photo Participants take a break from field training activities during Operation Tech Warrior 2018. Air Force instructors lead these exercises, which replicate military missions and tactics for the battlefield. WRIGHT-PATTERSON AIR FORCE BASE — Thirty-nine small businesses participated in Operation Tech Warrior, a 10-day, 24-hour immersion event hosted by the Air Force Research Laboratory of Wright-Patterson Air Force Base. The National Center for Medical Readiness hosted this annual event in Fairborn. https://www.fairborndailyherald.com/wp-content/uploads/sites/50/2018/10/web1_181004-F-F3456-1001.jpgSubmitted photo Participants take a break from field training activities during Operation Tech Warrior 2018. 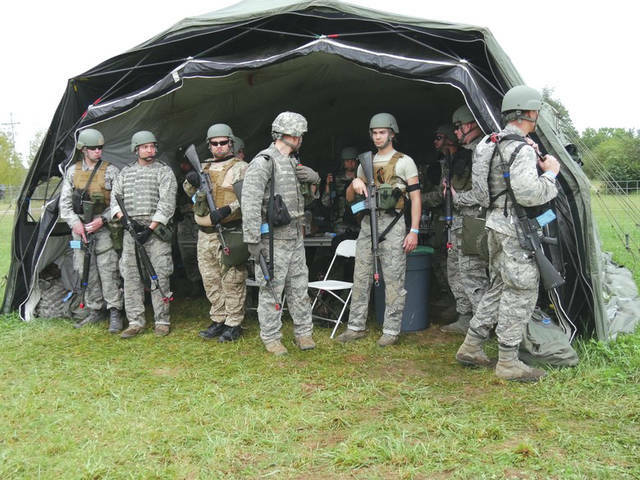 Air Force instructors lead these exercises, which replicate military missions and tactics for the battlefield.